Those not lucky enough to own a big house, as happens more and more often nowadays, especially those who live in metropolitan cities, they often have to deal with problems of space. Sometimes fit furniture and home accessories is a real challenge! The same applies to washbasins, which occupy a considerable space within a bathroom. And if this is particularly small, a normal sink can become cumbersome. What to do then? An optimal solution are the corner washbasins, which normally have their ideal location in the bathrooms for guests or anyway in very small and narrow bathrooms, where you must use all the available centimeters. The solution is then the corner washbasin, even though before you choose you should check that the corner measure exactly 90°, so to get an optimal installation. In the case of the corner sides being particularly large, it is possible to choose a corner washbasin also of standard size, that is, with a width of 60 centimeters. If you have limited space, you will need to opt for a smaller model, as a simple hand washing, basic shape and with a single tap. 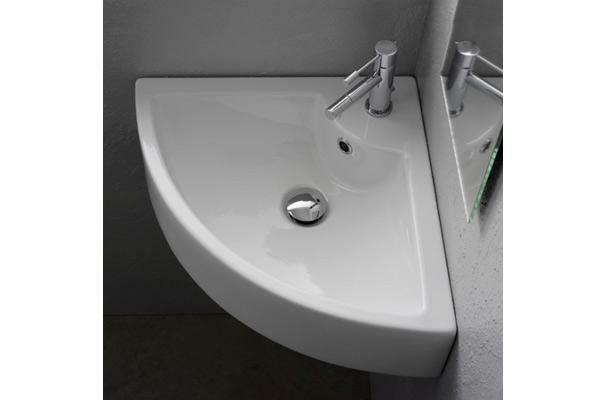 This type of corner washbasin is normally made in white ceramic, but there are models on the market even more original. Normally it is a wall washbasin, which can be symmetrical or have original shapes, with a space to place objects, such as soap dish, toothbrush holders. 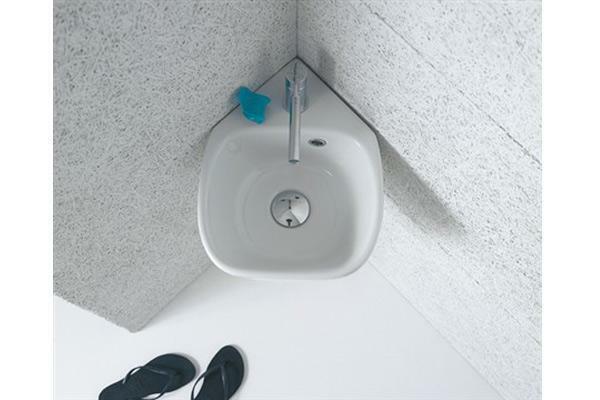 Duravit offers Architec, a corner washbasin without the overflow and made of sanitary ceramics. 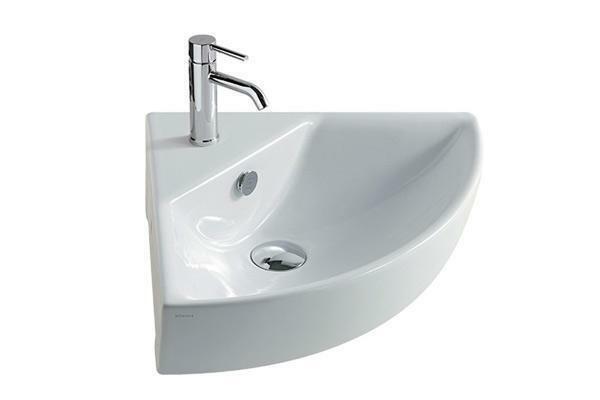 The product has an inner basin of circular shape and an angle valve, with the drain on the left in the mounting wall. The model is also equipped with a tap hole on the left and a dead hole for soap dispenser on the right. 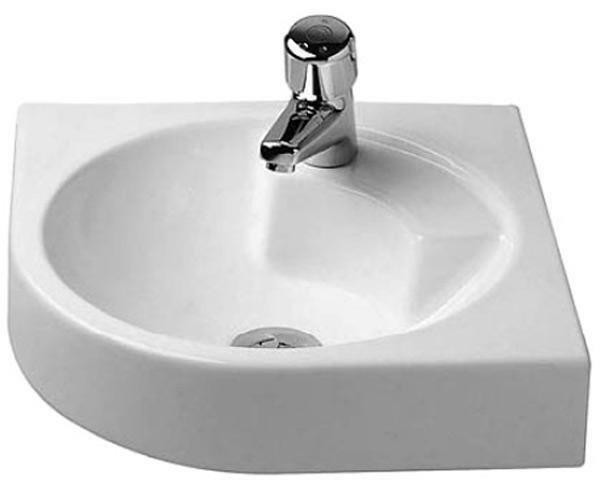 Ceramics Civic Castellana offers a wide range of products of this kind, as the white wall corner washbasin Modula Mini, which should then be completed with taps, drain, siphon and possible lateral towel holder. 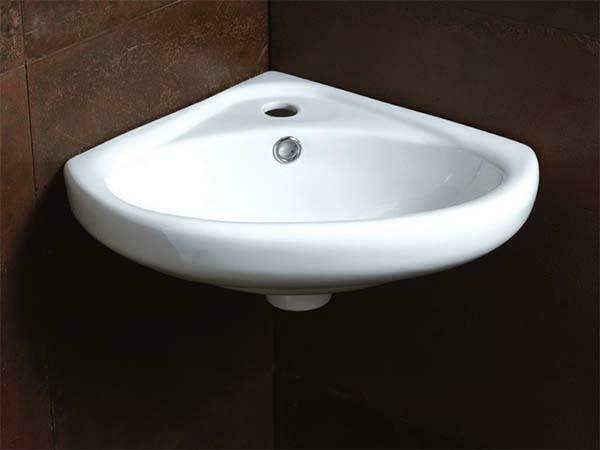 Or again the Square 8007/E, a corner washbasin that can be mounted on the wall or on the floor, according to the needs. It is available in classic white, or in a range of color options and with additional decoration. Then there is the corner washbasin Sleepy, a very straightforward and basic model, ideal for those who have very little space. Bagnochic also proposes several models, of various shapes and sizes. For example, for those who need space for storing things, there is the angle base with sink and mirror, complete with two curved doors, made in resistant MDF wood, complete with mirror and sink velvet resin. The angular shape basin is very durable and heavy. Instead it is very basic the corner washbasin 35, of small dimensions and installable on any angle. With this model it is possible to add a towel holder with a small price increase. Another proposal for those with limited space is the small wall washbasin Mega, with a projection of 29 cm which makes it suitable for the narrowest bathrooms. It's a great product category and the designers even managed to allocate the insertion hole for the mixer. Many proposals also by BagnoShop. One example, the corner washbasin 45 M2, which is part of the new line designed by the firm Galaxy Ceramics Italy SpA This innovative design that is minimal at the same time, fits perfectly in modern housing standards, where small and cozy spaces necessarily provide a suitable furniture, but still comfortable. The one hole corner wahsbasin allows you to maximize the space, using a corner of the room to have a bathroom fixture smart and functional. This does not exclude, however, even its use in larger rooms, such as loft or larger bathrooms, having a structure highly versatile. 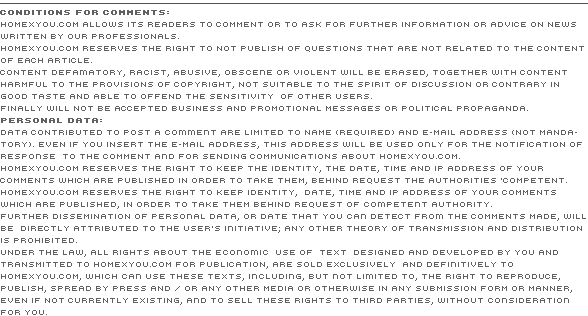 In fact, its size is very small, ie 45x45 cm, while the height is 14cm and the radius of 62cm. The weight is also minimal, being only 11.9Kg. Maison Plus offers a range of products in this category. Some examples? The corner washbasin Royal, 45x45 cm. A system that recovers the past, renewing it in the perspective of modern comfort, with a new style, offering two colors, black and white, freely combined.